The USGS Global Visualization Viewer (GloVis) is a quick and easy online search and order tool for selected satellite and aerial data, including ASTER Level 1T images. The GloVis homepage presents the user with a browse image viewer, menu bar, and navigation controls. Clicking the map defines an area of interest and displays color browse images for the selected sensor. GloVis provides access to all L1T images, with immediate download. 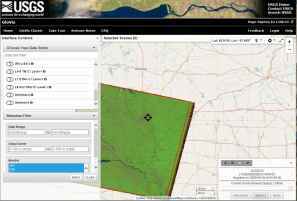 A USGS registered username and password are required to order any scenes through GloVis. Users can register for a USGS account by clickiing "login", then "create a new account".